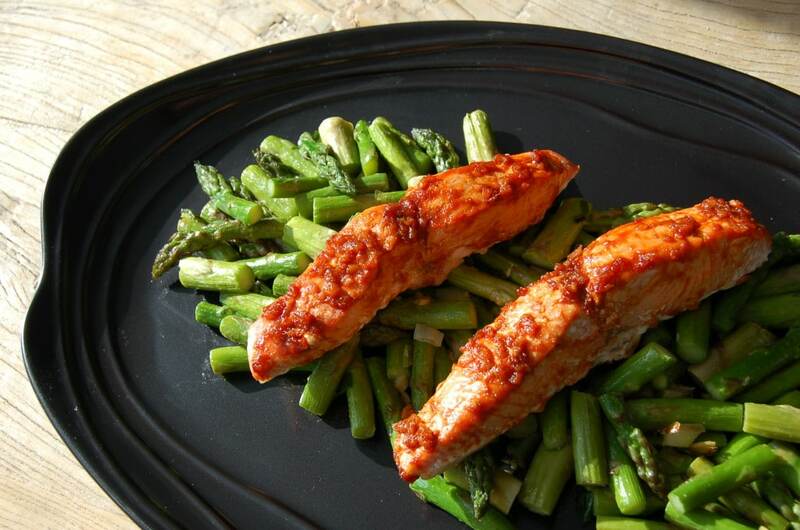 Shape magazine asked me to put together a few aphrodisiac recipes in honor of Valentine’s day, so I decided on this delicious chili ginger glaze, which contains a few of the foods purported to put you in the mood. Chiles: Chiles get your blood pumping, increasing circulation and stimulating nerve endings so that you feel more turned on. Honey: This sweet and sticky nectar is filled with B vitamins, needed for testosterone production, and boron, which helps the body use and metabolize estrogen. Lore has it that the term “honeymoon” comes from an old tradition in which newlyweds drank a honey drink for 30 days after marriage to help them get acquainted in the bedroom, and thus set the foundation for a healthy marriage. Whether or not the dish actually helps you score, I don’t know, but it is a quick, easy, and delicious dish to put together for your Valentine. Preheat oven to 425. Sprinkle salmon with salt, and bake for 8 minutes. Meanwhile, In a small saucepan, combine all glaze ingredients, stirring to dissolve the honey, bring to a boil, lower heat to medium low, and let cook down for about 2-3 minutes until slightly thick. Remove salmon from oven, brush thoroughly with the glaze, and put on top rack under broiler for 2 minutes. I made this the other night and not only is it very easy to make, but it turns out SO well. My salmon filets were 6 oz, so I just added 2 minutes of bake time and they were perfect. I have never made fish before bc I was intimidated by cooking it. I never thought it would turn out so great! Thanks Maria!